Sweet Creeks U.S. Bead warehouse Manager and Contest winner win a Trip To Japan To teach beading Flower method. "Cherry Blossom" Sweetcreek.com Owner of U.S. Bead warehouse In Florence Oregon are pleased to Announce Charmaine Presnell as International winner. Charmaine Pesnell a self taught artist and a resident of Florence has won the internationally known �Treasures of TOHO, Emerging Artist Competition� with her creation titled �Cherry Blossom�. Charmaine is sponsored by Sweet Creek�s US Bead Warehouse and pictures of her amazing entry can be seen at the Sweet Creek�s US Bead Warehouse at 3015 Highway 101. Or at www.sweetcreek.com Charmaine used the wonderful TOHO beads available at the bead Warehouse and says she loves their roundness and consistency. It took over 20,000 beads to weave a Geisha�s face into a covering of a bottle. The bottle is covered on both sides as well as the bottom, which shows her signature in the weaving. The top of the bottle is adorned with cherry blossom branches. The cherry blossoms being a vivid memory of Charmaine�s childhood living in Japan . The judging took place on June 4th at the 2009 Bead and Button Show in Milwaukee , Wisconsin . Charmaine is a painter, makes glass, is a silversmith and a bead weaver. �I heard about the competition at the US Bead Warehouse, while I had the design in my head for 2 years, the competition made it three dimensional. The bottle took me three months to create. At the time our son was a wounded soldier and my duty as a mother was to call him every day so he had someone to talk to. This beaded bottle gave me peace after my phone calls. I can see my pain and my peace in this bottle�. In the early 1990�s Charmaine was named one of the most 100 Watchable Artist in America by the South West Art Magazine. Charmaine�s �Cherry Blossom� has arrived safely in Japan will remain in Japan and on display in TOHO�s museum for one year. Just days before the judging Mr. Yamanaka, the founder of TOHO beads passed away. Mr. Yamanaka�s family has requested �Cherry Blossom� to be displayed at the funeral for Mr. Yamanaka. Charmaine says, �I�m driven to create art everyday. There is art in everything, a bug, a leaf, a person.� Charmaine and the manger of the Sweet Creek�s US Bead Warehouse, Kim McDaniel, have won a week long trip to Japan . They arrive in Tokyo where Charmaine has been asked to teach a class on her beading methods, they will then travel to Hiroshima to visit the Toho Bead Factory and museums, and then do some sightseeing. You can see other wonderful creations by Charmaine at the Florence Old Town Farmers Market on Saturday�s and Sunday�s. 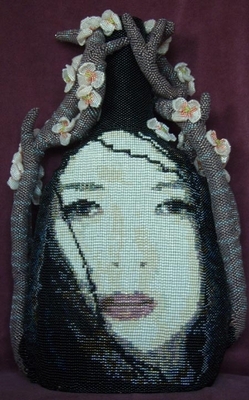 Sweet Creek�s US Bead Warehouse is honored to have sponsored this wonderful artist. You can see the picture of �Cherry Blossom� at the website for Sweet Creek�s US Bead Warehouse, www.sweetcreek.com. Once again our little town has been put on the map in the eyes of the world as there were numerous entries from all over the world. Charmaine will be teaching a class on how to make the beautiful, delicate cherry blossoms at Sweet Creek�s US Bead Warehouse in September of 2009.